It’s written by an archaeologist from BU and focuses on the archaeological remains of sewing found in historical sites around the world. I’m fascinated by all of it, in the most nerdy way–right now, I’m on the chapter about pins: how they’re made, when and how they were created and how they changed over time, and what they look like when found in an archaeological site. I had no idea there were so many varieties of pin heads throughout history, or that until the 1800s, pinning for sewing was the least of their uses! 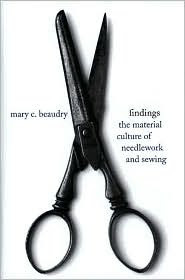 Apparently, clothing was all but pinned in place for most of human history, and pinning for sewing was somewhat second place. So this morning, while eating breakfast (I only ever get to read recreationally before bed and over cereal–and yes, I am such a dweeb that learning about archaeological pin facts counts as “recreation” for me), I was learning about pin cushions and their amazing variety. Considering that every pin until 1834 was MADE BY HAND, they were quite expensive, and represent a primary investment in a household, making their storage and even display a big part of daily life. ← Whipstitch: One of the 100 Atlanta Businesses to Know! It is interesting that needles and pins were so valued in earlier times. 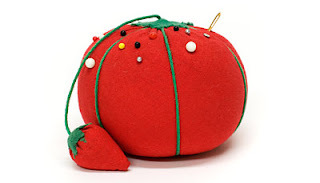 And who who sews has never had a tomato? I know I have owned several over the years but do not have one at this time. I found a magnetic bowl at a auto parts store that is wonderful for holding pins. Oh, I've been eyeing that book for awhile and it looks so interesting! It's going back on my to-read list. And I did see Gertie's post, how cool is that? We still carry little pin and needle cases in Turkey (we ladies, that is). They are about the same size as the one in the picture, though usually metal these days, and they contain a few straight pins, a safety pin, a needle and a little thread wrapped around a tiny piece of card. Good for repinning scarves that come adrift or sewing up accidental rips or buttons that pop off, etc. A bit like carrying your puncture repair kit round if you ride a bike, I suppose! Very useful!